With crime lord Charles Jericho now on the loose San Francisco faces a terrible threat. Only one man can stand against him. He has driven the streets of a hundred cities, spent his whole life putting criminals behind bars. But to take Jericho down, there can be no turning back, and he knows that this may very well be his last ride. His name is John Tanner. He is the Driver. 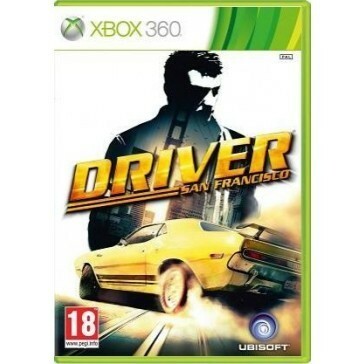 Driver: San Francisco marks the return of the blockbuster driving franchise. Gamers play John Tanner, a hardened detective involved in a relentless manhunt throughout the City by the Bay. Thanks to a groundbreaking gameplay feature, players can now seamlessly shift between more than a hundred licensed vehicles, keeping them constantly in the heart of the action. With its timeless atmosphere, unique car handling and renewed playability, Driver: San Francisco offers the free-roaming, classic, cinematic car chase experience. GameXS.in, pronounced Game'Excess'.in, is an online store dedicated to gaming and gamers in India. We created GameXS.in with the aim to allow Indian gamers do just what the name says i.e. Simply Play More. With a massive collection of new and pre-owned games, we at GameXS.in are determined to create a destination where you can get the games of your choice, whenever you want them. But that is not all!! We are bringing to you the unique opportunity to sell your games1 - within a few clicks from the comfort of your home - and get paid in Store Credits or Cash2 (Yes. You read that right!!! J). So get ready to put your old games library to use and play the best and the latest in gaming.